Immersion Corporation (NASDAQ:IMMR), the leading developer and licensor of touch feedback technology, today announced that it has signed a license agreement with Seoyon Electronics Co., Ltd. (Seoyon), a leading international supplier of automotive systems and products. The agreement provides Seoyon with access to Immersion’s patented haptic technology for use in its in-vehicle touch button panels, touch pads, and rotary switches. Immersion’s technology enhances automotive interfaces and applications. Increasingly, haptics is being designed into in-vehicle applications as more and more cars incorporate high-quality tactile effects for operations such as cruise control, stability control, entertainment, navigation, and climate control. Immersion Corporation (IMMR) is the leading innovator of touch feedback technology, also known as haptics. The company provides technology solutions for creating immersive and realistic experiences that enhance digital interactions by engaging users’ sense of touch. With more than 3,000 issued or pending patents, Immersion's technology has been adopted in more than 3 billion digital devices, and provides haptics in mobile, automotive, gaming, medical and consumer electronics products. Immersion is headquartered in San Jose, California with offices worldwide. Learn more at www.immersion.com. This press release contains "forward-looking statements" that involve risks and uncertainties, as well as assumptions that, if they never materialize or prove incorrect, could cause the results of Immersion Corporation and its consolidated subsidiaries to differ materially from those expressed or implied by such forward-looking statements. All statements, other than the statements of historical fact, are statements that may be deemed forward-looking statements, including, but not limited to, the statement that Immersion’s technology enhances automotive interfaces and applications, the statements regarding the incorporation of haptics into automobiles, Mr. Shimada’s statements concerning the impacts of haptics in automobiles. Immersion's actual results might differ materially from those stated or implied by such forward-looking statements due to risks and uncertainties associated with Immersion's business, which include, but are not limited to: unanticipated difficulties and challenges encountered in product development efforts (including with respect to Immersion’s touch feedback technology) by Immersion and its licensees (including Seoyon); unanticipated difficulties and challenges encountered in implementation efforts by Immersion's licensees (including Seoyon); unanticipated changes in the automotive industry; adverse outcomes in any future intellectual property-related litigation and the costs related thereto; the effects of the current macroeconomic climate; delay in or failure to achieve adoption of or commercial demand for Immersion's products or third party products (including automotive products) incorporating Immersion's technologies; and a delay in or failure to achieve the acceptance of touch feedback as a critical user experience. Many of these risks and uncertainties are beyond the control of Immersion. For a more detailed discussion of these factors, and other factors that could cause actual results to vary materially, interested parties should review the risk factors listed in Immersion's most current Form 10-K, and Form 10-Q, both of which are on file with the U.S. Securities and Exchange Commission. The forward-looking statements in this press release reflect Immersion's beliefs and predictions as of the date of this release. Immersion disclaims any obligation to update these forward-looking statements as a result of financial, business, or any other developments occurring after the date of this release. 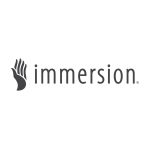 Immersion and the Immersion logo are trademarks of Immersion Corporation in the United States and other countries. All other trademarks are the property of their respective owners.